Eunice Jones received her first pair of shoes at 13 years old. They were a gift from her sister, in honor of Jones graduating from the sixth grade at her school in the Philippines. Little did they know, Jones would later receive multiple awards and hold several positions across different business areas in Salt Lake City. Eunice Jones at the University of Utah. Jones grew up being the seventh oldest of 11 children, in a very poor family. She was raised in a house that had no running water or electricity, and had to boil water before being able to drink it. At a young age Jones started working for money. She would clean her grandparent’s house every weekend for 25 cents. She went on to start selling bags of salt for 25 cents and 50 cents at the local market. And during summer school Jones sold bags of fried dough dipped in sugar to her classmates. Jones saved up her hard earned money in a piggy bank. And at the end of the summer she had enough money to buy school supplies for her siblings and herself. “My parents could not give us anything but education,” Jones said. Jones’ three older brothers and her older sister moved to Manila, Philippines, on scholarships. They gave all of their incomes to Jones’ parents, which eventually brought the rest of her family to live with them in a two-bedroom, one-bathroom apartment, in Manila. “Life changed when I went to Manila,” Jones said. For the first time in her life, Jones’ family had running water, television, electricity and public transportation to get to school. Jones’ sister sent her through college in Manila. She graduated in the top-10 of her class and was given an apprenticeship at a local press. Jones later became the single mother of two children. And in 1986, the Los Angeles Hyatt offered Jones a working visa. She left her sons with family and had to leave the Philippines within 30 days of the Hyatt’s offer. “I only had a suitcase, $50 in my pocket and a dream,” Jones said. Jones worked for the Los Angeles Hyatt for three years before being able to obtain visas for her two young sons. In 1989, Jones went home to bring her children to live in Las Vegas, where she was working at the Hilton. Jones got married in 1993 to Blake Jones and two years later the family moved to Utah. Eunice Jones got a job at the Salt Lake City Hilton, where the family lived in the general manager’s suite for two months before buying a house. “When we lived in the Hilton, it was weird because everyone was cleaning our room,” said A.J. Jones, Eunice Jones’ 24-year-old son. After Eunice Jones had worked for the Hilton for one year, she said that her work was not challenging and decided to change her career. She started attending real estate school at night and graduated in 1996. She began working seven days a week as a Realtor. And one year later, Eunice Jones received the Rookie of the Year Honor in real estate. Eunice and Blake Jones opened their own Re/Max office in 2003. They opened it with one Realtor and it grew to be 70 Realtors and independent contractors, before the market crashed. 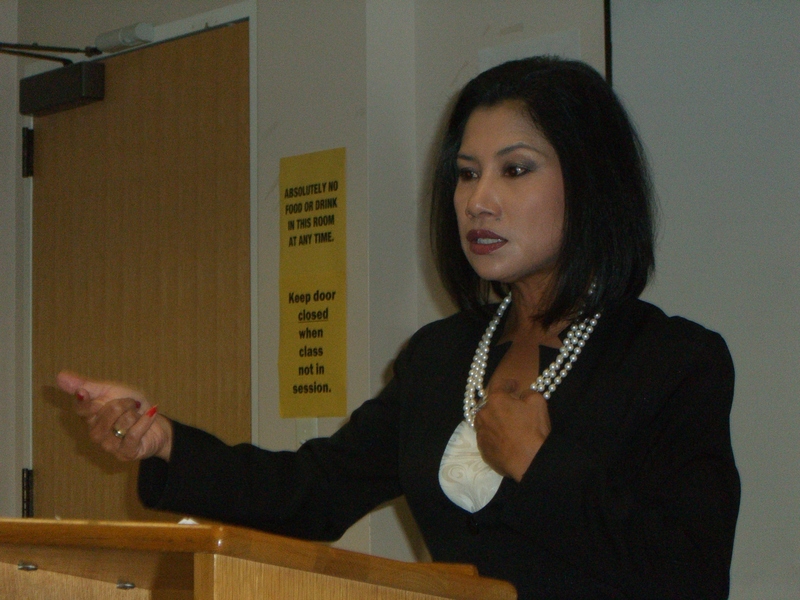 In addition to her work as a real estate agent, Eunice Jones also plays a large role in the Asian community of Utah. She was the first women president of the Philippine-American Association during her 1999-2001 terms. And she is a co-founder of the Utah Asian Chamber of Commerce. “I am so honored and happy to be part of this community,” Eunice Jones said. Jones is currently serving on the Asian Advisory Council and recently gathered members of the community to start a dance group that performs traditional Filipino dancing. Her hope is that it will help keep the culture alive for the different generations of Filipinos who are in Utah. Eunice Jones would like to retire from real estate in ten years. Her goal is to buy land in the Philippines so she could live there six months out of the year. “She moved here just for my brother and I. She misses her life and she sacrificed a lot for us,” A.J. Jones said, in support of his mother’s dream of returning home. Eunice Jones speaks with University of Utah journalism students about her life. As a child growing up poor in the Philippines, Eunice Jones paid for school supplies by selling fried dough rolled in sugar to the local townspeople. Now Jones, 51, sells properties as an associate broker of a Re/Max Masters franchise in Salt Lake City. How she moved from living in a hut in a seaside village to living in Utah as a distinguished member of the community is a true story of success that begins at her roots. “My parents always told us that they could not give us anything but education,” Jones said. As the seventh of 11 children, she was used to feeling hungry and going to school barefoot. Her family’s home had no electricity or running water and she often did school work by the dim light of a gas lamp. Yet her parents made sure she and her siblings studied hard and went to school every day. Her parents’ strong emphasis on education pushed Jones to excel and in 1980 she graduated in the top-10 of her class at the University of Manila with a degree in marketing. In 1986 she was offered an opportunity to work in the United States as a catering manager at the former Hyatt Wilshire in Los Angeles. Jones, a single mother, had to leave her sons, Thomas, 2, and Andrew, 2 months, with her mother and sister in order to move to the U.S. Even though she had to part with her children, the chance to come to America was something she couldn’t refuse. With the help of her friends and family, she scraped together the money for airfare and got on a plane to California. “I only had a suitcase, $50 in my pocket and a dream of a better life,” Jones said about her arrival in the U.S.
Los Angeles was like nothing she’d experienced before. She saw a washing machine for the first time. Her friend’s mother had to help her figure out how to use it and it didn’t turn out well – ­ all of her clothes shrank. Until she got her first paycheck, Jones had to borrow everything from friends. She moved to Las Vegas to work at the Las Vegas Hilton in 1989. It was there that she felt secure enough in her job and situation that she obtained visas to bring her sons from the Philippines to join her. In 1995 Jones remarried and moved to Utah with her new husband and children. She was hired by the Salt Lake City Hilton, but the work wasn’t challenging so she took real estate classes at night in order to switch careers. A year later she received the Better Homes & Gardens Rookie of the Year award. She opened her own Re/Max franchise in 2003. When she and her husband divorced in 2009 she sold her franchise to Re/MAX Masters, where she now works as an associate broker. Aside from real estate, Jones also devoted considerable time and energy to the Asian community of Utah. She is a leader in the Utah Filipino community and organizes the Utah Asian Festival. In 2005 Jones and Judge Raymond Uno founded the Utah Asian Chamber of Commerce, which helps bring Asian businesses together throughout the state. Jones is also head of the Asian Advisory Council, which is a part of the Utah Office of Ethnic Affairs. Jones’ story is a testament to the American dream and she has no regrets about coming to the U.S.
“My lifestyle [in the Philippines] was not as free as it is now,” she said. Her son, Andrew “A.J.” Jones, 24, feels the same way. He has visited the Philippines twice with his mother and says it was a humbling experience. “It was definitely a culture shock for me to see 12 people living in a small home, or in their shop/home on the side of the road,” he said. A.J., who is currently working on a bachelor’s degree in education at the University of Utah, also attributes who he is today to his mother. In high school, when he wanted to play sports, his mother would tell him grades came first. Now he balances sports and school as a Little League coach at Olympus High School. He says his mother set the example for making education his focus.